In the Oct. 14, 2005 installment of "Fanfare," Donna Leal mentioned the term "fierce moment" in reference to a drum corps moment experienced with the Cavaliers that was so powerful, it almost defied description. I asked for readers to send in their fierce moments and received the following in response. If you wish to add your fierce moment(s) for a future Fanfare column, please send them to me at boomike@dci.org. Michaela "Mickey" Smith marched Magic of Orlando in 2003 and hopes to march with one of her favorite corps this year. She has two separate stories to share. 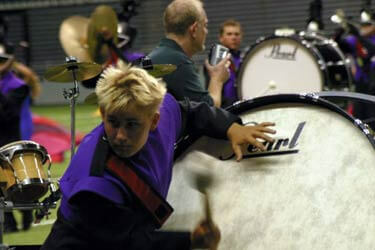 One of my fierce moments from drum corps comes from my home show in 2003. It was nothing more than a typical show in Broken Arrow, Okla. It rained that morning and all the Florida kids were hoping for a rain day, but I was quick to assure them that it would pass quickly, clear off and get hot. I was right. It was great to see my family and I was proud to have them come see what I was doing with my life, how I had changed and what I spent all that money on. However, it wasn't the presence of my family that moved me beyond words. (But don't let that fool you, it was great to see my family and I definitely appreciated the visit.) It was my percussion instructor from junior high and high school that really touched me emotionally. Nathan Jones began teaching me when I was 13 at the end of my 8th grade year. I had learned more over those five years than I could appreciate at the time and gained an amazing friend. It was no secret that I was attached to my instructor. To be perfectly honest, I adored him in every way, and I wanted to be just like him. That is how I got into drum corps. Nathan marched with the Glassmen in 2001 in the front ensemble, and when he got back, the changes the summer made on him were obvious, and I don't mean "corps chops" or the tan. He walked with a different confidence after that. I don't know that I can explain it with words, but I did know I wanted that same sense of confidence and that magic gift drum corps gives you. So after that I practiced, and I practiced. After much hard work and convincing, I talked him into giving me private lessons my senior year. In Aug. of 2002, I could do no more than hold four mallets properly, but he worked with me and got my technique to a more than adequate level in only a few months. As I progressed, I made known my lofty goal of marching for the same drum staff that he had marched for at Glassmen. That winter the staff changed corps and moved to Magic of Orlando and I followed. In a little less than a year I went from your average high school percussionist to overcoming more adversity than most could imagine. I found myself standing on a field in my home state, proudly adorning my corps' uniform and looking fiercely up into the stands. That July night I looked up into the stands and saw the face of my mentor proudly smiling down at me, and at that moment I knew I had that magic gift of drum corps. Note: Nathan Jones was a graduate of the Glassmen in 2001. You can hear him play on the Glassmen "Images" CD during the show and as the soloist on track four, "Fluffy Ruffles." He completed both his bachelor's degree (music education 2003) and master's degree (percussion performance 2005) at Oklahoma City University under Dr. David Steffens. Jones is currently performing on the U.S. tour of "Blast." Here's my second fierce moment: I learned a lot about being a decent human being from being in Magic, but the breaking down of the corps' food truck made for some challenges. Our food crew volunteers would go shopping every other day to buy food to keep us fed and we ate cold cuts, salads, and whatever could be fixed in a crock-pot, unless the housing site was gracious enough to let us use their kitchen. Many corps throughout DCI donated their freezer for the night. I can remember two separate occasions where Spirit fed the whole corps a complete meal; breakfast one day and then dinner before a show later in the week. The most memorable full-corps meal was definitely the one with the Cavaliers. They put out a whole spread of food. I'll never forget that. It was just such a cool feeling to know that no matter what happened on that competition field, everyone marching was really connected by something greater. We finished the season with a good attitude. I honestly wouldn't trade my summer for anything else because I know that I learned more than any other corps could have taught me. I learned life lessons above and beyond the average drum corps member, and for that I am thankful. Let's end with some further thoughts from Donna Leal, who first coined the term "fierce moment." SInce I had a fierce moment with the Cavaliers, in the interest of harmony, I've recalled a fierce moment with the Madison Scouts. One of my biggest drum corps regrets—other than the fact I was drum corps-free for more years than I care to recall—was that I never heard the Scouts play "The Way We Were." Of course, I was only 14 years old in 1975 and there was absolutely no conceivable way I could have hopped a plane and winged my way to Philadelphia for the DCI Championships. Still, I always regretted I never saw the big push in person—complete with my beloved "hat bow"—at the climax of "The Way We Were." As Finals were held in Birmingham, Ala. in 1979, there were numerous shows in the South as the corps made their way to Alabama. Some of my friends and I drove to Chattanooga, Tenn. for the last big show before the season culminated in Birmingham. 1979 was a strange year for the Scouts. The show was a bit different than past Madison shows, and was not always well received. I had seen the Scouts earlier in the year, so I wasn't expecting the direction the closer "Pieces of Dreams" took. Instead of hearing the ending I had heard earlier in the season, the Scouts tore into the climax of "The Way We Were." It was so unexpected and such a wonderful surprise. To this day I still tear up when I recall what a magical moment that was-and still is. I finally heard my Scouts do my much loved to this day ending to "The Way We Were."